Internet Search: this post is addressing new computer users who might dable in the internet searching. It seems a bit redundant to talk about internet searching when all over the place we hear phrases like “Google it” or “look it up”. I haven’t heard yet the terms “bing it” or “Yahoo it”. Actually the “yahoo it” term doesn’t sound as good as “Bing It” and of course not even close to “Google It”. But for all the hipe that Microsoft build around Bing, “Bing It” might easily be confused with “ping it” a term used in Information technology departments and by people who spend most of their time involved with the computing world. Now, a bit on the search engines: How could I put this in such a way that covers the beauty of internet searching? The reality is that Google is the market dominant search engine. So if anyone wants good results he or she should use Google for exceptional results on Internet Search. At one point Yahoo was the market dominant search engine and it was The search engine at the time. However me personally I used Excite, of course I did not know about their inner workings at the time. In the last few years or so Microsoft has invested a lot in their old MSN search to overhaul it to Bing. A lot of TV advertisements has gained the a lot of market share but Google still remains on top. Search engine inner workings: I wish I would be an expert on this but I hope this will do. A search engine is a mathematical algorithm implemented on a monstrous computing structure built of many, many computers / servers or server farms. This costs money and it is simply monetized trough advertisement and perhaps other means. Large companies and small pay per click to have their advertisements placed at the top of the search list and on the side. Just do a search to get the idea. The driving force are the key words or the search terms. These search terms employ armies of people trying to have their web sites listed at the top. In a few words this type of business is called Search Engine Optimization (SEO) or Search Engine Marketing (SEM). Lots of hours are spent to predict keywords, or search terms that YOU might come up with. This effort is not mostly spent on prediction of keywords but many other tactics to drive a webpage at the top of a search engine based on the keywords. There are keywords which pay $50 per click. In short if you have your website with ads and that ad costs $50 and someone clicks on it, you just made approximately 70% of $50. But things aren’t this simple your website has to be impeccable. Now search engines offer tools to find keywords and synonymous expressions to your search terms. There are entire teams which work together from both camps to establish good practices of building websites. Before, the business of SEO / SEM was shrouded in a foggy cloud, now is very organized and extremely competitive. And all in the name of the mighty click, YOUR click! There are many ways to get at the top of a search engine listing but one of the easiest way is to satisfy real needs and wants, even if your site might not be impeccable. But that doesn’t mean you’ll get the $50, that depends on the content you have and which niche it serves. If you offer something that people genuinely need your page will be found online. But these needs are difficult to pinpoint and satisfy. Someone else might have already fixed the problem or served that need. But many might want to do it just to be relevant and see where it it may take them. The search term can be simple like “internet search” or as complex as an entire paragraph. It seems natural to many people to assume that a short string search like “internet search” would produce many results and an entire paragraph will produce very few results. For example if you’re studying for some kind of exam and you’re looking for a problem to see if someone has already solved it or at least asked the answer then you can type in the search engine the entire problem text to see if there are any matches. Another thing about internet search is that it takes some imagination and refinement over time and learning how to formulate search terms or keywords, some people are just natural at it. At one time I was trying to find out who was the inventor of those elaborate Tom and Jerry traps. I have heard of him but I didn’t retain the name. And one day I really wanted to know his name. So I was thinking in the terms of trap inventor or elaborate traps. But I could not get the results I wanted and I asked my coworker how should I search for it. I told him that the person I’m looking for is recognized for those Tom and Jerry elaborate traps. I already had that information but for some reason it did not dawn on me to just search for that. So he told me to try that instead. And it worked, his name is Rube Goldberg if you were curious, and there are a lot of people who build these elaborate traps record them in action and post them on sharing video sites. Look it up if you want to satisfy your curiosity. Sometimes is just good to ask someone how would they formulate their keywords regarding a topic and then you can refine it to narrow it down to the desired results. Search engine specialty: the first one’s are Web search engines and they search the web. But there are shopping search engines, Video search engines, Image search engines, Wiki search engines (Wikipedia.com) and who knows what else. All major sites have their own search engine, check out Amazon.com. If you want to find out how many there are it will take some research. There are many search engines out there but we’ll focus on general Web search engines, because they are the most used and even them too will get you Video results and picture results, and maybe shopping results depending on what the search term is. Internet Browsers, the most used ones are: Internet Explorer, Mozilla Firefox, Google Chrome, Opera and the others I do not know. These days all of them are coming with a search box, search bar or browser search, set up to one of the major search engines. This search box is set by default to a specific search engine, obviously Internet Explorer being a Microsoft product its search bar will be set to Bing. But sometimes this also depends on the computer manufacturer, because the manufacturers have this nasty way of building new computers and filling them up with crap because the Software manufacturers give them incentives. So if your computer comes with Google Chrome, besides Internet Explorer, then you can figure out that Google somewhere somehow did some favors to your computer manufacturer. For example when you buy a $600 cell phone, but it only costs you a hundred or two, then the Cellphone service provider will funnel the extra $400 to the cost of the phone from the money you pay for your service contract and phone calls. So in the end somewhere somehow the consumer ends up paying. The same way with computers, there are a medium of advertising other services to YOU. And it is cheaper for you to buy a $400 PC which contains an operating system like Windows than pay $400 only for the Operating system give or take some depending of the flavor of the OS. There are also free Operating Systems out there but is not yet convenient for a novice to work with them because of many factors. 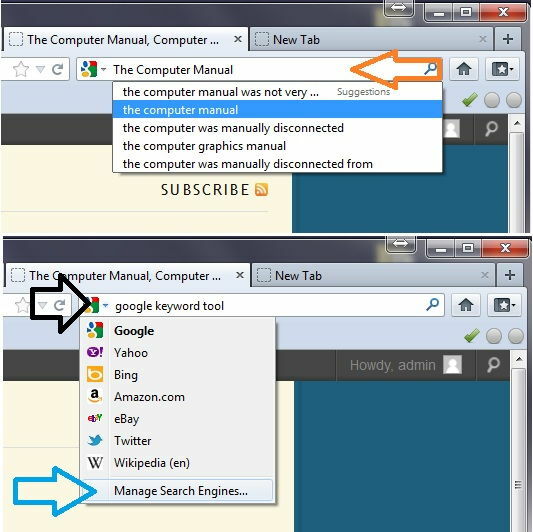 Returning to the Browser search or search bar, it can be changed to any Search engine recognized out there. But by default it comes preset to a specific one, and novice users will stay with that one because they are not aware of the possibilities. Well, this is why The Computer Manual is here, to make you aware of the generalities of the computing world starting with the very basics. In the image below you can see a browser search bar which has a search term in it and below in the drop down menu you see the suggestions which are synonymous to the one in the box. All internet browsers have tabs so you can have multiple web pages opened within the same browser window but in separate tabs. You can see the “new tab” and next to it a + sign to open another tab if you need to. I am mentioning this because, still users don’t know about these simple features which improve our lives and save computer resources. If you look next to the black arrow you can see the Google icon designating the Google search engine as the default search engine. If you click on the icon you get another drop down menu from which you can set up other popular search engines. Next to the blue arrow you can manage and find more search engines. Usually you have installed on your computer more than one internet browser, and only one of them is the default one. The rest will always ask you if you want to make it the default or not. You can disable the question, but I feel that many are afraid to do so, because they would not know how to change their default browser at a later time if they wanted too. 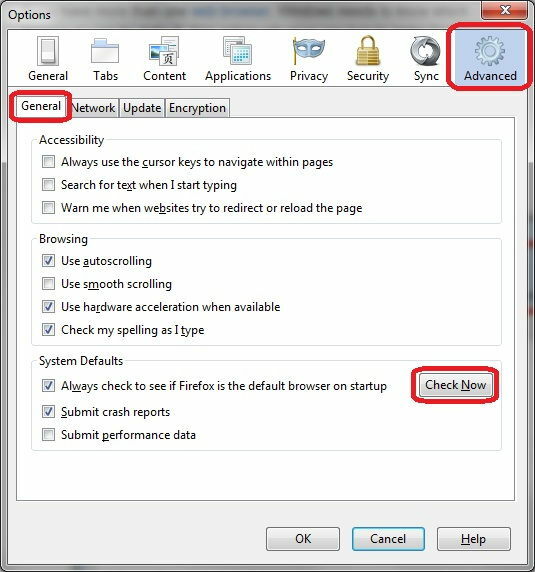 Below there are images on how to change or verify if your Firefox browser is your default browser. 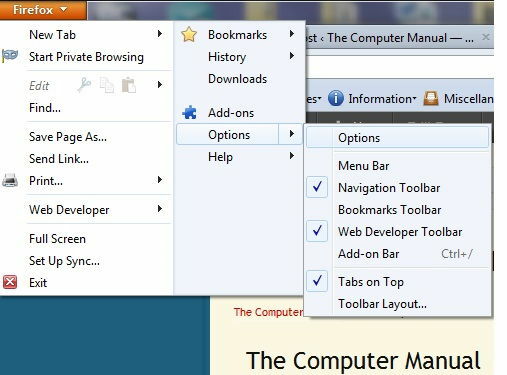 Now in the Firefox options check to see if it is the default browser. Another great way of searching the internet is to change your preferences to display 100 search results on Google instead of 10. I used to do this all the time every time I would renew my user profile. Because I grew to know that most of the times the better information was down below and not in the first 10 search results. You can keep that 10 results per page stuff on your phone to save the bandwidth and not have to pay a monstrous bill to your cell phone provider. But at home I would like to have 1000 results! So far a hundred will do. 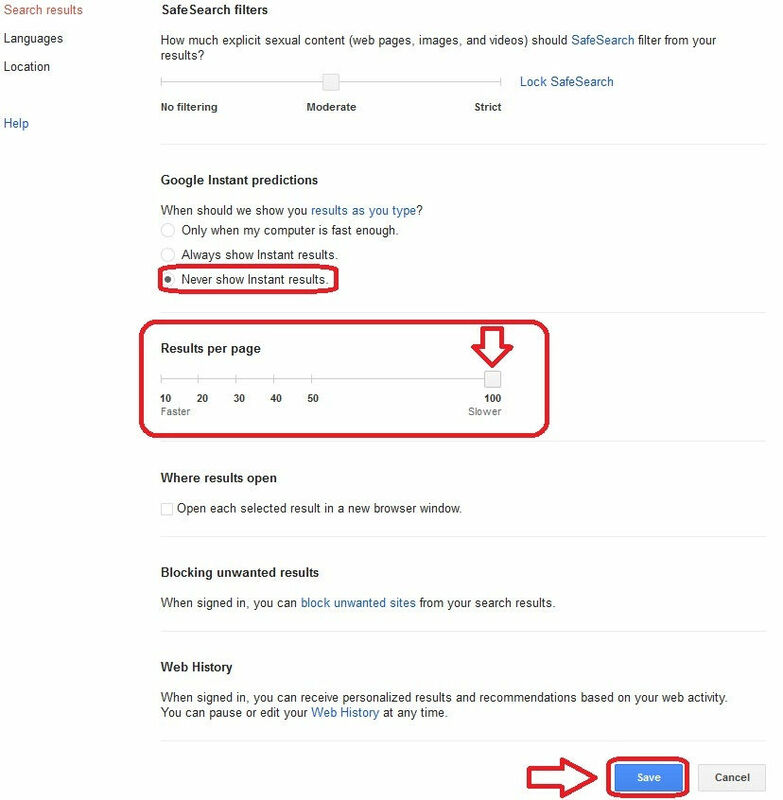 Below you’ll find how to change your settings on the Google search engine to have a hundred search results per page. After having searched for something click the settings icon and then select the search settings. In the next page change the settings to display 100 results. You have to select “never show instant results” and then move the slider bar to show a hundred results per page, all the way to the right. This way you’re allowing yourself to view more results. It doesn’t mean that if they don’t show up in the first ten they aren’t as good. It means that the other website did better SEO/SEM. Their content might not be as good as the 37th one but they did better SEO. Now just click the save button and you’re on your way to be become very wide minded!